It is being reported that Mali’s Prime Minister, Cheikh Modibo Diarra, was arrested by soldiers last night, indicating a deterioration in Mali’s political situation despite some progress last week. The leader appeared on national television after his arrest, announcing his resignation from his post as the nation’s leader. Mr. Diarra is being accused by the army of “playing a personal agenda,” according to the New York Times report. The incident could mar an international effort to mitigate the very fragile political situation. The European Union agreed this week to send 250 soldiers to Mali tasked with training 2,600 Malian soldiers to defeat Islamist groups that have contributed to a humanitarian crisis there. Mali’s political situation has deteriorated significantly this year. The European Union’s contribution of forces is the latest step in an upscale of military intervention in the northern Mali. The forces will be under the command of the Economic Community Of West African States (ECOWAS). The African leaders are waiting for the endorsement of the United Nations. 2012 has been a tumultuous year for the West African nation. The country went through a coup d’etat in March, only to lose control of the north to Islamist groups, such as al Qaeda, soon after. The Malian army, which has been under equipped, under paid and subject to internal division suffered a number of defeats during the Tuareg Rebellion. This has led Lieutenant Amadou Konaré and military officials to overthrow the President Amadou Toumani Touré on March 22 because of “the incapacity of the government to give the armed forces the necessary support to defend the integrity of the national territory.” The new military junta created a transitional government but essentially left a power vacuum throughout the country. The rebels, MNLA and Ansar Dine took control of the two biggest towns in North Mali, Gao and Timbuktu, after the junta ordered the governmental army to fold back. The MNLA declare the Azawad (North Mali) independent from the Malian government in Bamako, the capital. The Malian government has officially lost control of all of North Mali, where Sharia law is now strictly enforced by Islamist groups. The negotiations between the military junta and the ECOWAS countries led to the establishment of Dioncounda Traoré, previously president of the parliament, as the interim President of Mali for one year, during which he is required to organize democratic elections. The Tuareg rebellion has been slowly hijacked by the hard-liner Islamist groups. The Movement for Unity and Jihad in West Africa (MUJAO) defeated the MNLA and took over the town of Gao in the beginning of June. The Tuareg rebels were also forced out of Timbuktu by the Islamist group Ansar Dine. North Mali is now controlled by three Islamist groups: Ansar Dine, a Salafist group lead by a Tuareg; Al-Qaeda in Islamic Maghreb (AQMI); and MUJAO. The latter two are considered terrorist organizations. The control of the region by the Islamist groups has led to many exaction: murders, rapes, stoning, amputations as well as the destruction of many sacred mausoleum, especially in the region of Timbuktu, listed in the UNESCO World Heritage. The hundred of thousand of people that have had to flee the regions since the beginning of the rebellion has added a humanitarian crisis to the conflict. On October 12, the UN Security Counsel gave 45 days to African leaders to advance a detailed military plan for the fight against the terrorist groups in North Mali. 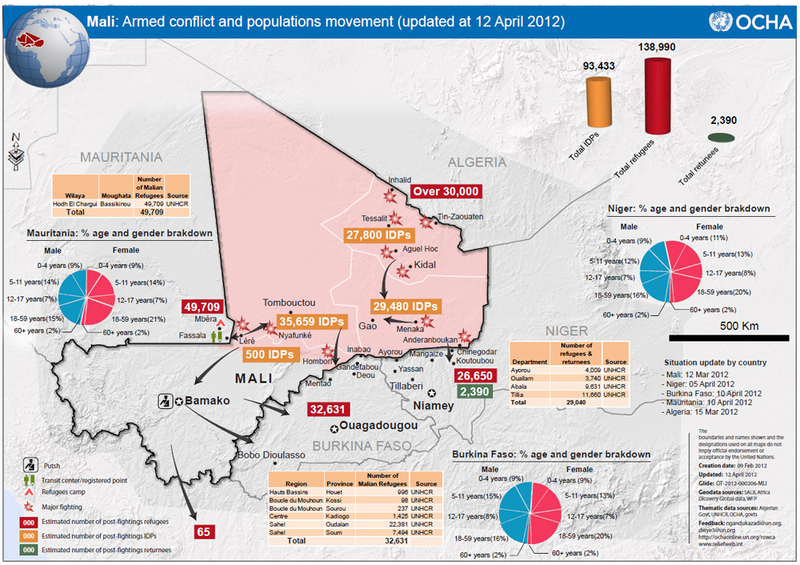 On November 11, the ECOWAS agreed to send 3,300 men in North Mali. The African Union agreed to the deployment. The African Union has asked the UN to give their approval for a one year deployment, under Chapter VII of the UN Charter which allows military intervention to maintain or restore international peace and security. On Wednesday, December 5th, at a UN Security Counsel meeting, France, the biggest backer of military action among Western nations, asked that a decision be made by December 20th. However, Washington is unlikely to back such a move as it would prefer to wait until after a new government has been elected. UN Peacekeeping Chief Herve Ladsous believes that a military intervention is necessary, but not before September 2013. In the meantime, the ECOWAS council has encouraged Malian officials to meet with the Tuareg and the Ansar Dine spokesmen in order to reach a negotiated end to the crisis. Mali’s neighbors fear the country’s instability will allow Al-Qaeda to spread further in the region. Thus, these countries would favor an agreement with the Tuareg and the Ansar Dine, which have distanced themselves from the terrorist groups in the recent months. During last week’s meeting the two rebel groups agreed to a ceasefire. However, the discussions about a military intervention, which would only target the terrorists groups AQMI and MUJAO, continues.